Brief Synopsis – A sailor is jailed for striking a politically connected bar patron on a small island and instead of being kept confined in prison, tries to escape and return to his family. My Take on it – I have always been a fan of John Ford’s films and he was always great at delivering pic films. This film is presented in the same fashion, but unfortunately the story itself isn’t epic enough. The story itself drags on a bit too much and that takes away from the enjoyment here because it just doesn’t flow very well. 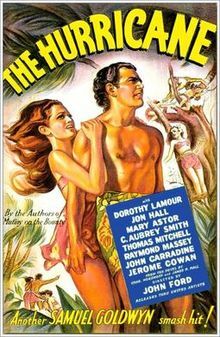 This film can somewhat be perceived as an updated version of Tarzan as a man of the jungle must find a way to live in “modern” society. The cast is quite impressive, but unfortunately most of them aren’t given enough to do here. Thomas Mitchell was nominated for an Oscar for Best Supporting Actor for his performance here despite the fact that he doesn’t play a character who stands out or is impactful enough throughout. What makes this film worth watching are the amazing special effects used for the climactic scene of the hurricane itself which was quite advanced for its time and it quite wondrous to watch unfold on the screen. Bottom Line – Interesting idea that is dragged along too much. Ford knows how to make epics, but this film is far from being one. In some ways this feels like an updated Tarzan story which hurts any real impact it might have. The cast is quite talented but they aren’t give enough to do. Mitchell was nominated for an Oscar for Best Supporting Actor for his performance here even though he doesn’t manage to stand out enough in the role. The special effects used for the hurricane itself are quite advanced for its time and looks wondrous to watch but that is the sole highlight of this film.